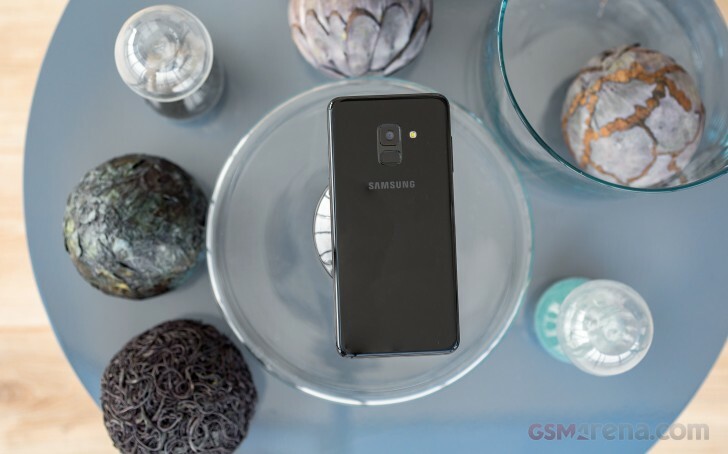 Samsung Galaxy A8 (2018) is not a successor to a particular A-series phone. It's more of a trimmed Galaxy S8 version for the masses with matching design, screen, and the current number 8. Or so Samsung would have us believe. Indeed, Samsung is changing its naming convention once again. 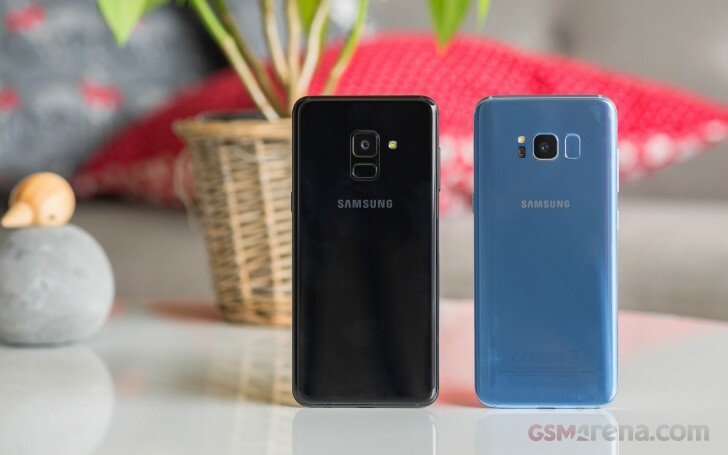 While before the number denoted the physical size of the phone in the midrange class, now it has come to show the generation it comes in and we're up to gen8 if the S and Note series serve as any guidance. That's not to say that the Galaxy A8 (2018) doesn't have a predecessor - it's the Galaxy A5 (2017). And the new phone is an upgrade in almost all respects except perhaps for the main camera. Visually, the A8 is indeed closer to the S8. The similarly shaped and sized curved glass-sandwich design, the tall AMOLED screen, and the fingerprint on the back are some of the features which show the close relation between the Galaxy A8 and the S8. There is even a notable selfie upgrade - the A8 now comes with a dual-camera at the front with a variety of effects, including portrait photos with defocused background. The Galaxy A8 (2018) seems like a thoughtful alternative to the headliner without losing much of the S8's charm. And if the price is right, then Samsung may have done an excellent 'S8 lite' model. The Galaxy A8 (2018) would probably go down in history as the phone to fix the badly placed fingerprint scanner for Samsung's phone portfolio. It may look like a Galaxy S8 and have the whole flagship vibe, but the balance on the back has been restored. The fingerprint sensor is now conveniently positioned under the main camera. The new placement aside, the biometric sensor is always-on, fast and very accurate. The latter is pretty much guaranteed by the lengthy setup process with more than the usual number of taps. 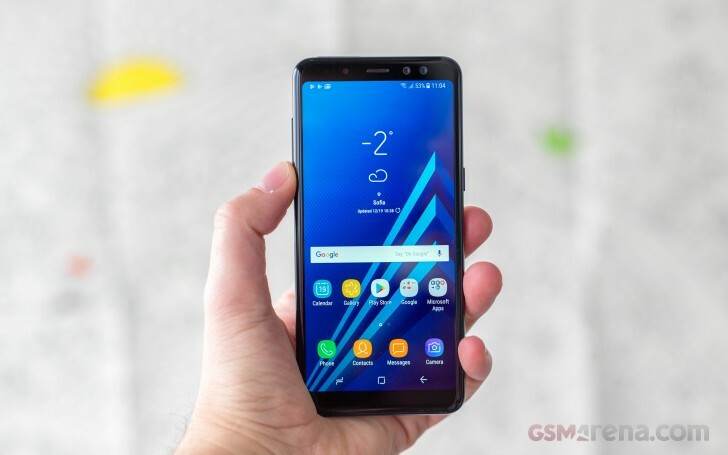 The slightly curved AMOLED display is one of the biggest treats - it's sporting the cool 18.5:9 aspect ratio though the resolution of 1080p is slightly lower than the S8's 1440p. 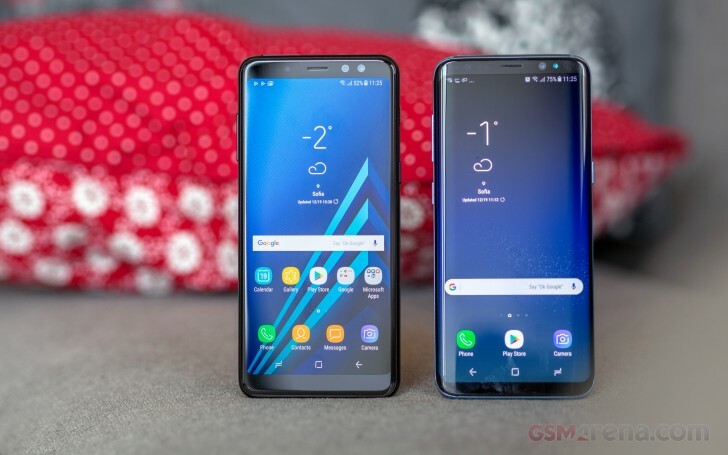 The screen has the same round corners as seen on the flagship model, but while both phones are similar in size, the A8's display is 0.2" smaller than the 5.8" unit on the S8. Speaking of sizes, the Galaxy A8 is thicker and 20g heavier than the S8. The A8's screen bezels are obviously bigger, though it's nothing major to hurt the otherwise sleek design. The top bezel is jam-packed with stuff - the earpiece, the two selfie snappers, a bunch of sensors, and even a notification LED. The bottom has nothing though. 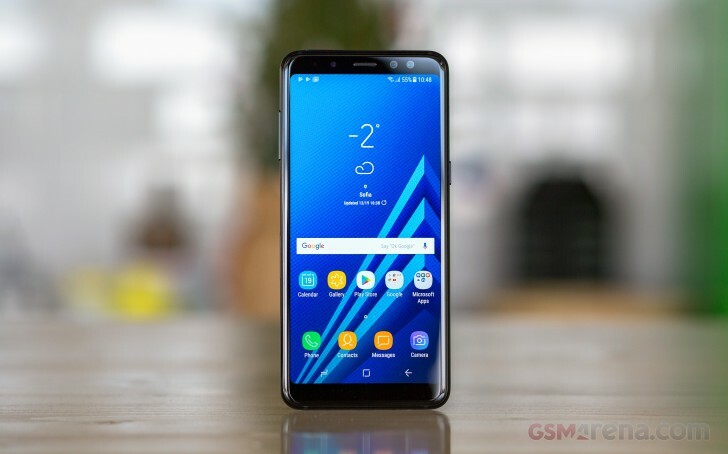 There is no pressure-sensitive home key on the screen of the Galaxy A8 (2018), it's one of the things the S8 series will be keeping as an exclusive. The Galaxy A-series was treated to IP67 grade ingress sealing in 2017 and the trend continues onto the 2018 editions. And no cards were lost in the process - even on the dual SIM version of the A8 (2018), you don't have to sacrifice storage expansion for a second SIM. We definitely appreciate the dedicated microSD slot. Finally, the loudspeaker on the Galaxy A8 (2018) is on the right side, above the power button. It looked like an odd placement when Samsung introduced it on last year's A-series, but we've come to accept it after it also became the choice for positioning on the J-series of 2017 as well. Misc: Rear-mounted fingerprint reader (centered, hurrah! ); single speaker on the side; 3.5mm jack; Samsung Pay support; Gear VR support.